Have the Finns FINALLY worked out how to use touchscreens? 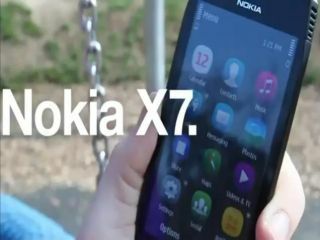 The new Nokia X7 has been outed by Three in a promotional video for the network, and comes with a good look at the forthcoming Symbian UI improvements. The new Nokia X7 looks to be a pretty decent handset on specs alone, coming with an 8MP camera with dual LED flash, a large 4-inch ClearBlack OLED screen and a pretty nifty metallic chassis. The video was uploaded by Three but taken down shortly afterwards; thankfully some quick-witted internet people managed to get their own copy and kept it available for all to see. What's more exciting (especially for Nokia N8 users) is the new Symbian UI shown off deals with a lot of the issues we found in our N8 review. The homescreens now have a more dynamic scroll about them, the widgets are overhauled and more interactive (and of different sizes) and the internet browser is reportedly much, much faster. We're also 'treated' to a portrait QWERTY keyboard... but it's not like other manufacturers have managed to put that in for over three years or anything, is it, Nokia? We're now looking forward to the Nokia event tomorrow with a heightened level of fervour than before - will we get a date when Nokia N8 owners will finally get the user experience they should have had from the start?